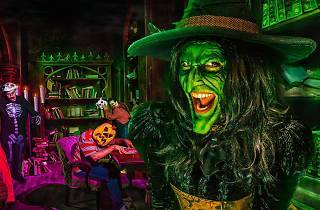 Evenings around Halloween, Knott's Berry Farm transforms into Knott's Scary Farm, with more than 1,000 monsters roaming 10 mazes, four "scare zones" and two live shows. 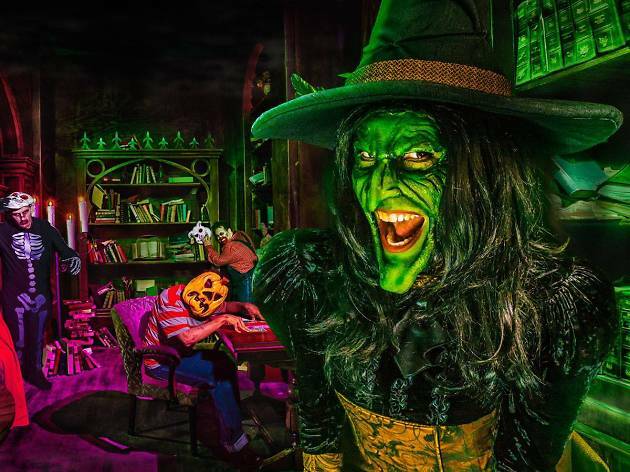 It's one of the largest (and oldest) Halloween events held at a theme park and includes the classic Elvira, Mistress of the Dark, for a twice-nightly big top show. The long lines for the haunted houses and the roller coasters are worth the wait. They also let you purchase and drink beer in the park – so plan ahead when you drink a lot of beer and wait in long lines! You’ll totally have to pee. They have pizza, Pandas, Johnny Rockets, etc in the park. I usually run to In-N-Out beforehand since it’s cheaper than park prices and gives me time to digest my food before I go in the park and ride a rollercoaster. Parking is $20. This is a fun place for teenagers and adults. It is definitely scary. I would recommend splurging and purchasing the fast pass lane tickets, because wait time can get up to two hours for each attraction. this is one of my favorite haunts of all time. Knotts 40th haunt had much to be afraid of and there is a scare at every corner...LITERALLY. Every year there is much more to fear.